Large cape cod style home. Hardwood, ceramic, and tile floors. Large eatin kitchen with granite counters, loads of cupboards, patio door to deck and salt water Hybrid pool, 4 good size bedrooms .Master bedroom with 3 piece ensuite bath. Family bath on second level with laundry. 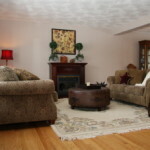 Two bedroom Inlaw suite in lower level with separate entrance and full bath. No offers no showings till open house Jan 24th 2-4. Oversized driveway with single attatched garage,fully fenced private yard. 2 sheds.